The World Health Organization (WHO) will fly a Cuban doctor diagnosed with Ebola to Geneva. This entry was posted in Top Story on November 19, 2014 by admin. Analysis: Helms-Burton — Obama’s secret weapon to end the embargo? 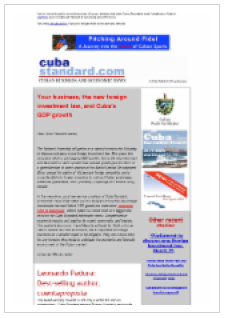 Cuba Standard: Tim Ashby, a Miami lawyer and former Commerce Department official, suggests Obama use his executive power to ease the U.S. embargo against Cuba. This entry was posted in Top Story on November 18, 2014 by admin. Cuba Standard: With rhetorical fanfare and fireworks, officials at the Havana International Fair presented Cuba’s new investment portfolio, a $8.7 billion wish list of 246 projects.